Do you like chocolate? 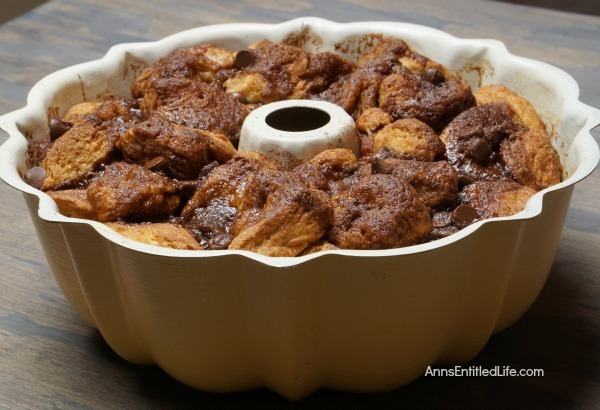 If so, this Monkey Bread is the recipe for you. 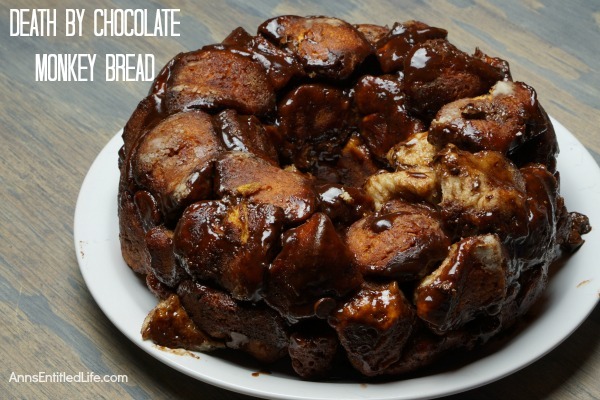 Oh so delicious, this mouthwatering Death by Chocolate Monkey Bread recipe is a fabulous dessert or a decadent breakfast: it is simply to die for! • Spray bundt pan with cooking spray, coat with flour. • Cut individual biscuits into 4 pieces each. • Place cut up biscuits, sugar, and 2 tablespoons cocoa powder into a large ziploc bag and shake gently the bag to coat the biscuit pieces. 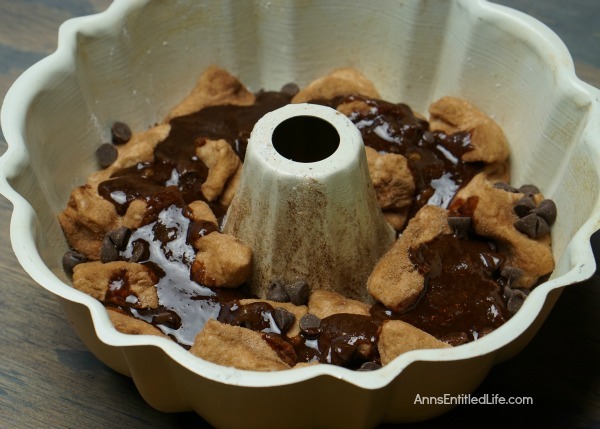 • Mix melted butter, brown sugar, and remaining cocoa powder in small bowl. • Place half of the coated biscuits in the prepared bundt pan; sprinkle half of the chocolate chips, half of the chocolate syrup and pour over half of the butter mixture. • Repeat process with the remaining coated biscuits, chocolate chips, chocolate syrup and melted butter mixture. • Bake for about 35 minutes. Edges will be dark brown and center will be lighter. • Let cool for about 5 minutes. • Place a large plate over the bundt pan and flip over. 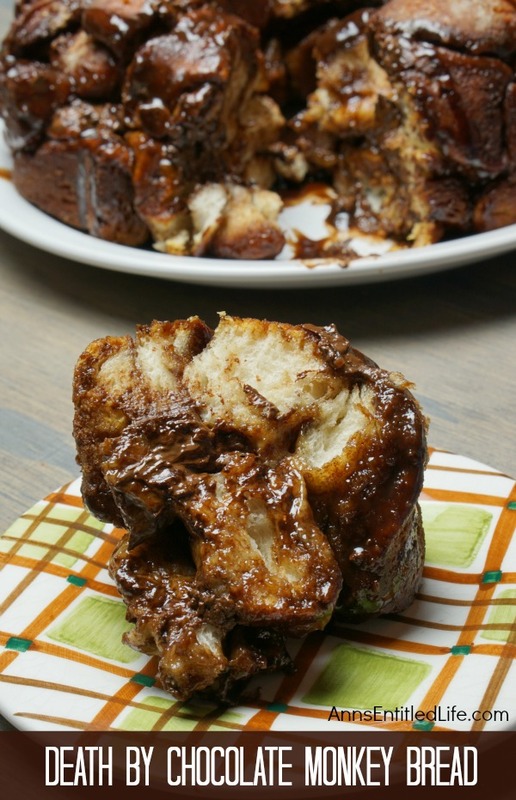 • If desired, drizzle more chocolate syrup over the monkey bread. 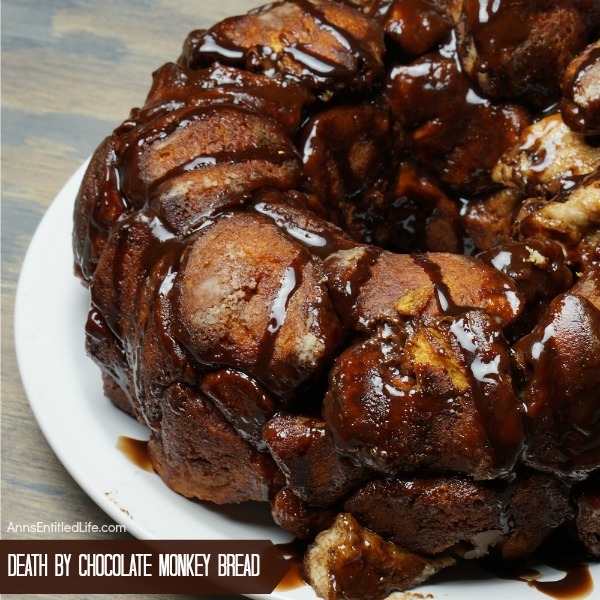 • To print the Death by Chocolate Monkey Bread recipe click here. • Spray a bundt pan with cooking spray, coat with flour. Oh wow! My kids are dying to try this! Thanks for sharing!!! I hope you all like it, Stephanie!! This is a must try soon Thanks for sharing Ann! I hope you enjoy it, Theola! 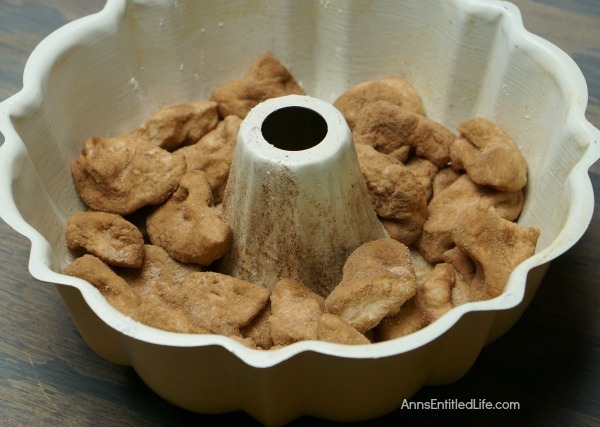 My family loves traditional monkey bread but this sounds fabulous! Thank you so much for sharing your recipe. Wow, this looks divine! Thanks so much for sharing your yummy recipe on the Monday Funday Party! Why do we need the extra chocolate syrup? Isn’t the brown sugar mix with cocoa the same? Has anyone tried it with nuts?